(SKNIS): First brought to the attention of the St. Kitts-Nevis National Assembly on November 15, 2017, by Attorney General, Honourable Vincent Byron, that Leader of the Opposition and Member of Parliament for Saint Christopher Six, the Right Honourable Dr. Denzil Douglas, was in violation of the Constitution by holding dual- citizenship, the Attorney General’s Office has instituted legal proceedings against Dr. Douglas, a parliamentarian of over 20 years and a former prime minister. “I’d like to report that having had advice from Senior Counsel on this matter, the Office of the Attorney General gave instructions to institute legal proceedings in this matter and so yesterday, January 22, a fixed date claim form was filed in the High Court Registry to initiate a matter to get the court to make certain declarations and findings,” Attorney General Byron said at the first sitting of the National Assembly for 2018 (January 23). The fixed date claim form, which is numbered No. 8 of 2018, is a matter between the Attorney General of St. Kitts and Nevis, Claimant, and Dr. Denzil Douglas, Defendant. 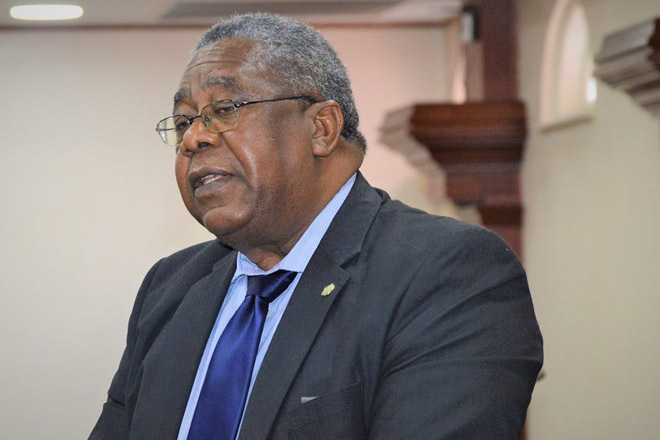 The application to seek relief from the High Court is pursuant to Section 36 of the Constitution of St. Kitts and Nevis and Section 12 of the National Assembly Elections Act Cap (2.01). Additionally, costs, an injunction restraining Dr. Douglas from sitting in the National Assembly and performing his functions as a member, and such further and/or relief that the “honourable court may deem just and expedient” are being sought. Attorney General Byron stated to the House that Dr. Douglas was issued a diplomatic passport No: DP 0000462 by the Commonwealth of Dominica, which recorded him as being a citizen of the Commonwealth of Dominica. “This is borne out by a certificate of exhibits thus filed among the papers at the court,” he said. It was reported to the court that the Defendant in the matter, Dr. Douglas, left the Federation of St. Kitts and Nevis by air using the same Dominica passport on April 23, 2016. The passport is stated to be valid until July 29, 2020. Section 28 (1) of the Constitution of St. Christopher and Nevis and Section Six (6) of the National Assemblies Act both provide that “a person shall not be qualified to be elected or appointed as a member if he is by virtue of his own act under any acknowledgment of allegiance, obedience or adherence to a foreign power of state”, said the Attorney General. The Leader of the Opposition, Dr. Douglas, was named and suspended from the National Assembly for the first sitting of the National Assembly in 2018 (January 23) for five days for unparliamentary conduct, after Attorney General Byron announced legal proceedings against him. Dr. Douglas was also evicted from the law-making body on January 20, 2017, the first sitting of the Parliament in 2017 for reprehensible behaviour.